All Victorians are invited to have a say on proposed plans to demolish the Yarra Building at Federation Square and construct a new Apple Global Flagship Store. The plans are currently being advertised by Heritage Victoria due to the Interim Protection Order placed on the site following the National Trust’s nomination of Fed Square to the Victorian Heritage Register. 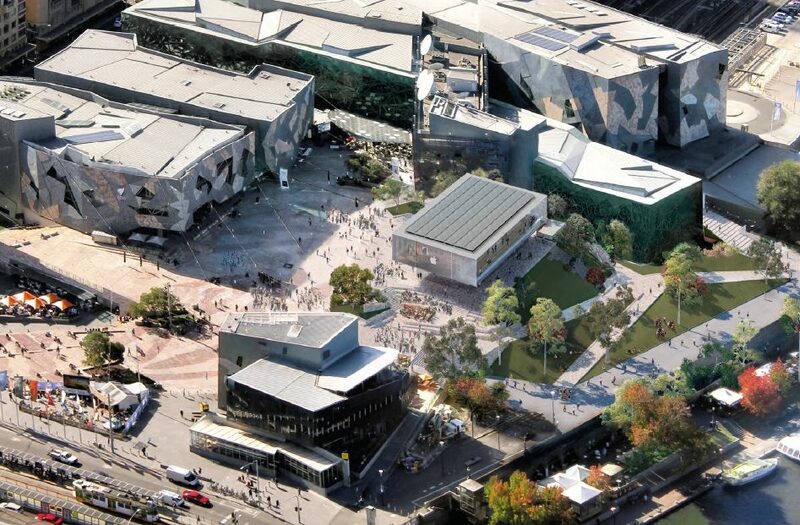 On Wednesday 30 January 2019, Heritage Victoria advertised a permit application for the demolition of the Yarra Building at Federation Square. The permit application includes the most comprehensive documentation about the project which has yet been made publicly available. Permit documents can be downloaded at Heritage Victoria’s website, or via our Dropbox. To make a submission, email heritage.permits@delwp.vic.gov.au. Submissions close on Wednesday 13 February. Written submissions should consider the impact of the proposal on the heritage values of Federation Square, and clearly state whether you support or object to the proposal. The heritage values of Federation Square are outlined below. For more information about the process, and tips on writing your submission, download our Advocacy Toolkit. 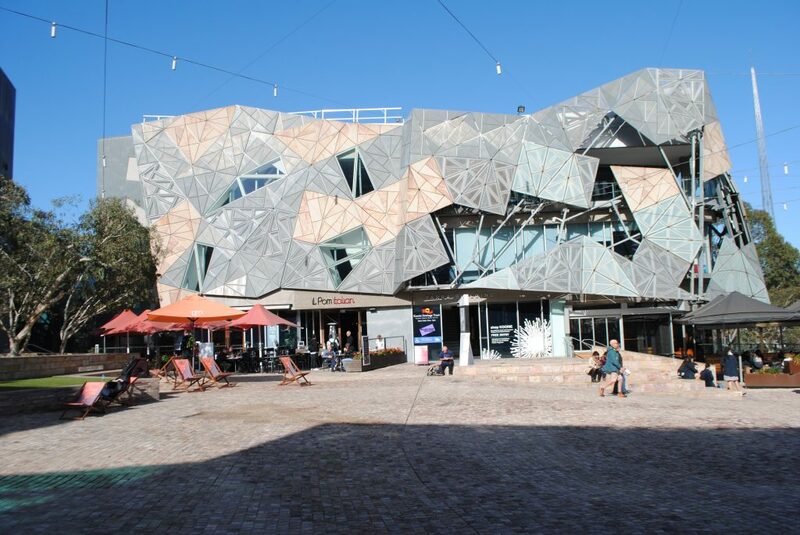 Following the National Trust’s nomination of Federation Square to the Victorian Heritage Register in July 2018, the Executive Director of Heritage Victoria has issued an Interim Protection Order (IPO) while the heritage registration is processed. In October Heritage Victoria has made a recommendation to the Heritage Council of Victoria that it be permanently added to the Register. Following a period of public consultation, the Heritage Council received an unprecedented number of submissions, more than 750 in total, mostly in support of heritage protection. A hearing has been scheduled for 15-17 April 2019. 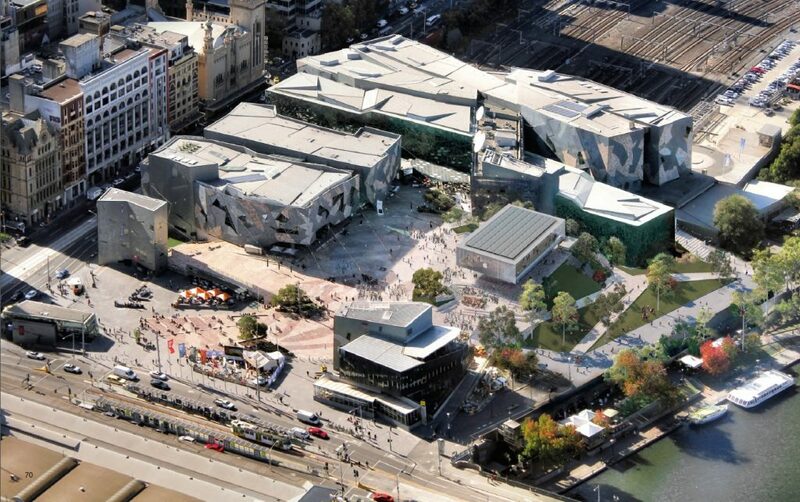 I wholeheartedly support the submission of the National Trust in opposition to the proposal to demolish a major component of the overall design concept of Federation Square to construct a building totally out of keeping with the site. Further, Federation Square is for the enjoyment by all of arts and entertainment. Existing small scale operations (restaurants) are consistent with this concept. A large commercial operation is not. There are existing Apple stores in Melbourne CBD and Docklands and a further construction demonstrates an unnecessary monopoly by an international company, rather than an enjoyable space for all. Federation Square is a fabulous space. It is aesthetically pleasing and well utilised. One of the keys to the Sqaure is there is no retail. People just pass through, meet others, go to an event or dine. Any change to the vendors is the Sqaure should only be in existing buildings. The fact that Apple changing Fed Sqaure in such a significant was is even an option is a travesty. Please leave Fed Sqaure for all the people. I do not support the demolition of part of Fed Square to build an Apple store. Not only would this be a waste of resources, the design of the new building is at odds and doesn’t fit with the Square. We object to the proposed redevelopment of Federation Square. The proponents to build an Apple Store on part of the site fail to understand the cultural and aesthetic significance of the space. Those responsible for the care and management of the square need to “lift their game”. A simple reply. It is not appropriate. I have a different view. The Yarra Buiding is the least distinguished part of Federation Square and has not attracted sustainable use, although intended for commercial purposes. It blocks the view of and easy access to the Yarra. A different building which integrates well with the rest of the square, allows better Yarra access and has a sustainable commercial purpose will add to the viability, social, cultural and economic, of the Square. While I personally dislike the initial look of the Apple building and hope it can be redesigned, I have no problem with an Apple ‘flagship’ outlet in the Square, with the other cultural and commercial uses already there. (I have no connection with Apple, other than as a user). I am strongly against he idea of Apple opening a shop at Federation Square. It is innapropriate for them to inhabit a public space that is supposed to be used to meet, socialise and share joy and cross cultural exchanges. There are plenty of other spaces they could open a shop. We don’t need consumerism based ventures taking over the little non commercial based public spaces we have left. NO THANKS ! While the Yarra building does restrict the view of the River from the Square, this does not mean something nearly as large and obstructive (as the planned Apple Store will be) should be built in its place. A better solution should be possible, resulting in the opening up of the Southerly aspect – perhaps by the judicious use of glass walls – without the complete destruction of the ambience of Federation Square by the building of an unattractive commercial building. Melbourne is lucky to have Federation Square for many activities including arts, the gathering of community groups, and small businesses such as restaurants. The large international company Apple will change the atmosphere. I support the National Trust’s opposition to the proposal to demolish a major component of the Federation Square so as to replace it with a building unrelated to the overall design. Please do not destroy an important Melbourne icon. I think building an Apple store in Federation square is inappropriate, the area is usued a lot for gatherings of all sorts by the community. Having a large retail store like Apple will change the atmosphere and the purpose of the area. I support the National Trusts opposition to this project.